July's impressive string of every-day events continues into weekend four of the Drum Corps International Tour which will feature a dozen competitions stretching the United States from Ohio to California. As a precursor to Saturday's DCI Premier Events, two shows will get the weekend started on Friday July, 9 in Loveland, Colo. and Akron, Ohio. 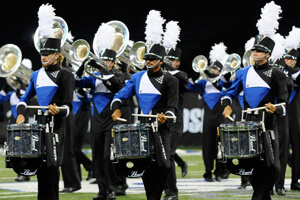 Drums Along the Rockies – Loveland Edition, a brand new DCI Tour event, will be the very first time West meets East in 2010 as the Cadets, Glassmen and Colts go head-to-head with the Blue Knights, Santa Clara Vanguard and Troopers. This will also mark one of the very first performances of the all-age High Country Brass in a DCI competition. Cleveland NBA fans mourning the loss of their King James to Miami need only to drive 44 minutes south to Akron, Ohio on Friday to have their spirits lifted. Innovations in Brass at the brand new InfoCision Stadium will feature a court of drum corps' own royalty including the Bluecoats, Cavaliers, Carolina Crown, Phantom Regiment, Boston Crusaders, Madison Scouts and Spirit. of Western Mich. Univ. 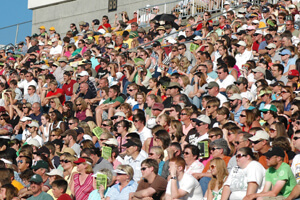 's Waldo Stadium in 2008. Satuday's showdown at the Drums Along the Rockies corral in Denver will add the Blue Devils into the same lineup from Loveland. A competitive storyline to watch will be the very first matchup of the season between the Cadets and Blue Devils who have been trading off at their respective competitions as keepers of the high score of the season. Also to watch will be the Blue Knights who will be performing on home turf and looking to continue to establish themselves in the upper echelon of this year's corps. Yes there really is a Kalamazoo! On Saturday, 10 World Class corps, with the Open Class Colt Cadets and hometown team Legends, will be at Western Michigan University's Waldo Stadium. As the biggest event of the season in Michigan, this is DCI's first trip back to "Kzoo" since the 2008 DCI Tour. With the majority of World Class corps out in Denver and Kalamazoo Saturday, back on the West Coast, the California State Open in Fremont, Calif. will feature an impressive lineup of eight Open Class corps as well as the Mandarins, Cascades and all-age corps Renegades and SoCal Dream. 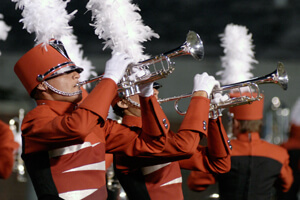 The 2010 Tour swings over to the Chicago burbs on Sunday, July 11, as the 27th annual Cavalcade of Brass returns to North Central College in Naperville, Ill., which is an event presented by the Cavaliers. Additionally on Sunday over on the Left Coast, you might consider bringing your heavy duty OSHA approved ear protection as the Renegades host the "Loudest Show on Earth" at Diablo College in Pleasant Hill, Calif. This will be an identical lineup to Saturday's Fremont show, featuring 12 Open, World and All-Age Class corps. The longstanding Summer Music Games in Cincinnati is the highlight of the schedule for Monday, July 12, bringing eight corps to Fairfield, Ohio including the local all-age corps Cincinnati Tradition. Though the Sky Ryders were last seen in DCI competition back in the early '90s, the spirit of the corps lives on in its former hometown of Hutchinson, Kan., which will host the Allstate Starlite Drum-O-Rama on Tuesday, July 13. That same day, Indianapolis drum corps fans will get a taste of the World Championships to come when seven World and Open Class corps take the field in Carmel, Ind. (17 miles to the north of Indy) for Drums Along the Monon. Four of the seven corps heading to the Drums Across Nebraska event on Wednesday, July 14, have World Championship titles under the belts, which should make for an exciting showdown in Omaha. That lineup will include the Cadets, Blue Devils, the Cavaliers, Santa Clara Vanguard, Glassmen, Blue Knights and the Colts. The sum of those groups minus the Vanguard plus the Troopers will then travel the Oregon Trail to Sioux Falls, S.D. to round out the week on Thursday, July 15 for the Sioux Empire Spectacular.